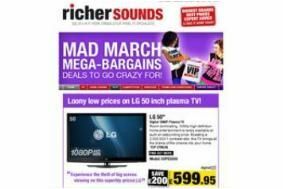 HOT DEALS: Mad March bargains from Richer Sounds | What Hi-Fi? Highlights include a 50in LG 50PS3000 Full HD plasma for £599.95, a Pioneer BDP-120 Blu-ray player for £99.95, LG's BD390 Blu-ray player for £199.95 and the Panasonic DMP-BD80 for £179.95. There are deals on all-in-one DVD and Blu-ray systems too, with LG's 2.1 HB354BS Blu-ray system on offer at £349.95, and Sony's 5.1 DAVDZ680W DVD system for £319.95. If you'd prefer a separates AV system, you can buy a Sony STR-DN1000 AV receiver and KEF KHT1005.2 5.1 speaker package and get a free LG BD360 Blu-ray player. The package costs £699.95. And there are plenty more hot deals on flatscreen TVs from 19in up to 50in. Check out the Richer Sounds website for details.